As I shout “Merry Christmas” from the open window of an all-wheel-drive sedan, I’m eager as a longtime automotive journalist to promote the added safety and security of AWD in a full-size, four-door automobile. We in Colorado, where winter weather surprises sometime border on treachery, have become accustomed over the past 20 years to four-wheel drive and AWD capability in virtually all the SUVs and crossovers and majority of pickups delivered into the state. Not so for the large sedans, though; for a number of years many drivers to respond to winter perils were faced with choice of trading in the comfort of a sedan for an SUV or truck, or adding an alternate vehicle to the stable. Chrysler, when it redesigned its 300 model into a full-size, rear-drive four-door for 2005, offered optional AWD. It caught on quickly around here. The Dodge Charger, Ford Taurus and Buick LaCrosse have followed in its tracks. Other popular big cars, such as the Toyota Avalon and Nissan Maxima and Chevrolet Impala, retain their front-wheel-drive-only setup, missing increased sales with AWD. Nine inches of snow was on the ground and blowing one day last week when we backed the 2016 all-wheel-drive Chrysler 300 sedan from the garage and headed for Jan’s doctor appointment. The 300 maneuvered somewhat predictably and maintained fairly good grip, even on deep-snow and icy inclines. How successful in these parts has been Chrysler’s offering of AWD for its 300? 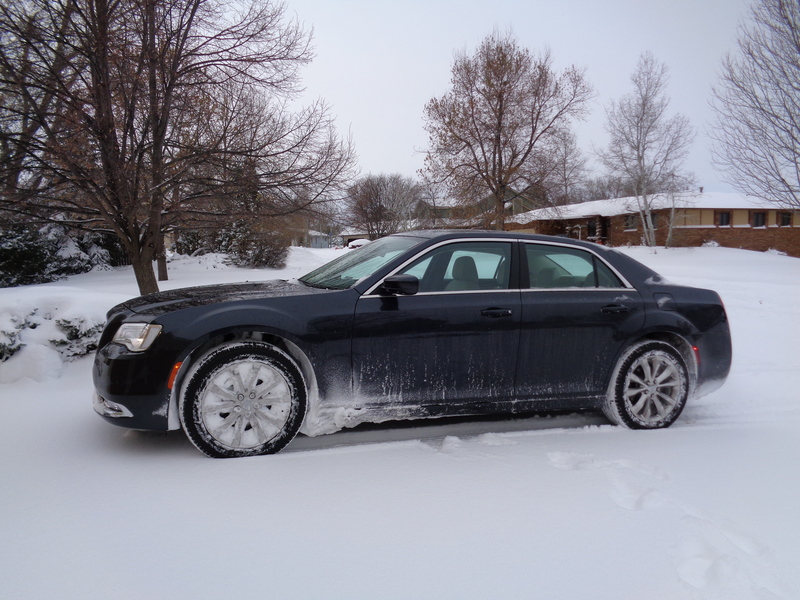 Of Chrysler 300 sales in the Denver/Colorado region, 77 percent are equipped with AWD. Many of those who venture out in the worst of conditions embrace the benefits of all-wheel control. Driving skill is primary; the AWD is a secondary edge that increases security in this tough-driving part of the country. The model I drove last week was a ’16 Limited with 300-horsepower, 3.6-liter V-6 engine and 8-speed automatic transmission shifted with a rotary dial on the center console. Its AWD system engages at any speed, splitting torque between front and rear wheels for optimal traction; a fuel-saving feature is a front axle-disconnect function. The Chrysler also carried Jan and me on a less-cold evening to Denver, where we helped recognize David Muramoto as new president of the Rocky Mountain Automotive Press (RMAP), succeeding Andre Smirnov. It was the annual RMAP Christmas party, in the Bud Wells Board Room of the Colorado Automobile Dealers’ Bill Barrow Building at Speer and Grant. The 300 carried a sticker price of $38,385, including a preferred option package of GPS navigation, 8.4-inch touchscreen display, USB ports and integrated voice command with Bluetooth, dual-pane panoramic sunroof and remote start. I currently have a 2014 Chrysler 300 AWD. It is a great car and like the size of the car and the comfort when driving it. Would like to know what you think of the rotary dial shifter that has become available on the Chrysler 300 from the 2015 year and after. Would like to know what you think of that shifter as it is very likely I will trade again for another Chrysler 300.